It is quite possible that even those who do not own a LinkedIn account know that the primary purpose is to build and enhance networks. LinkedIn has a few tools that I have found useful to share with other LinkedIn users and to learn from others in my industry. I am an active Twitter user and have connected my Twitter and LinkedIn accounts such that what I post on LinkedIn can also post to Twitter (I have also done this in a social media dashboard that I use, HootSuite, where I can select the tweet to post to Twitter and LinkedIn). This is not mandatory; I do have the option of just strictly posting the content on just LinkedIn. But, think about your audiences who follow/link to you on different social networks you might be involved with – might some of your postings apply to more than one audience? If so, why save time and post to more than one network by clicking just one “share” button? 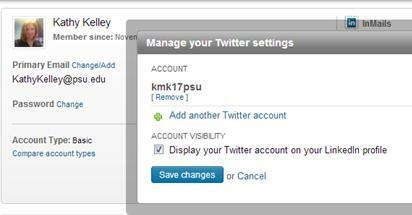 How to set up the ability to post to LinkedIn and Twitter simultaneously. Why have I chosen to do this? The more often that my posts appear on any friends’, followers’, or linkages’ feed - the more often they (may) see my posts, topics I like to discuss or contribute to, and may be more likely to read these posts, access my other social media profiles, and view me as more of a resources who shares information that is of value to them. Aside from sharing content on LinkedIn, I have also been asked, and obliged, to provide recommendations for some of my connections. A recommendation is merely a shot description of the person’s skills, experiences you've had based on interacting with them, and similar. Consider other businesses that you have relationships with. If you were to endorse them on LinkedIn – could you help build their reputation and credibility as a leader in their industry? Certainly, you would not want to provide recommendations for each and every LinkedIn user you are connected to, so be selective and provide honest insight as your name, as well as reputation, is tied with you include in the recommendation. An example of a recommendation I wrote for a guest lecturer who has spoken in one of the classes I teach at Penn State. It is not necessary to wait for someone to ask you for a recommendation in order for you to write one, rather anytime you click on one of your connection’s profile you are presented with the option: “would you like to recommend (name)?” Pretty simple and straightforward just like your ability to add/select keywords that describe your connection’s skills or expertise. · You do not need to join most groups to view what members are posting, unless it is a closed group and an administrator must approve your membership before you can participate, but if you want to receive updates with about the group’s activities (posted on your feed page) you do need to join. · You can join up to 50 groups and browse discussions, learn about promotions group members are offering (e.g. classes, special discounts on merchandise), job postings, and see a listing of group members. Groups can be very useful resources. Members post questions and other members can respond or “like” comments. My own experience with joining a group evolved from connecting with key group members to asking group members to suggest topics for a course I teach. This informal exchange resulted in some interesting and diverse comments and viewpoints. Even if you never initiate a discussion, it is interesting to learn from others about how they solved a problem similar to what you are experiencing or learn about potential opportunities. This is the message I wrote and that was posted on my group's page. Other group members provide thought provoking and valuable replies. filter the entire list of groups by language and/or by instructing LinkedIn to only select groups that your connections belong to – doing this narrowed my results to 880. If you do not find a group that you want to join you can always create your own. The process is very straightforward and you have the option of having an open or closed group. Additionally, you can alert others about your group by using the “invite others” option in each group’s page. By clicking on this link an email is generated with a brief description of the group’s purpose that you can send to others who might be interested in joining. In the last of this series of blog postings on LinkedIn I'll describe company pages and how easy it is for businesses to build their own.